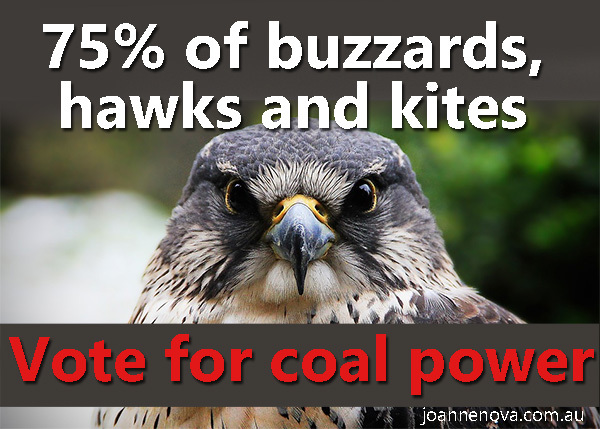 Wind turbines either kill or scare away three quarters of buzzards, hawks and kites at three sites in India. That makes them the new “top predator” in the ecosystem according to new research. Perhaps not the niche that Greens were expecting wind farms to occupy. It’s not all bad news though, fan-throated lizards are pretty happy about not being dinner. Wind turbines are the world’s new ‘apex predators’, wiping out buzzards, hawks and other carnivorous birds at the top of the food chain, say scientists. A study of wind farms in India found that predatory bird numbers drop by three quarters in areas around the turbines. This is having a ‘ripple effect’ across the food chain, with small mammals and reptiles adjusting their behavior as their natural predators disappear from the skies. The cascading effects of wind turbines on lizards include changes in behavior, physiology and morphology that reflect a combination of predator release and density-dependent competition. By adding an effective trophic level to the top of food webs, we find that wind farms have emerging impacts that are greatly underestimated. There is thus a strong need for an ecosystem-wide view when aligning green-energy goals with environment protection. 300,000 wind turbines too late.